My last post on flying with a baby had to do with timing, both the age of the child and the time of the flight. This next article has to do with packing for the flight and getting through the airport. Packing for a flight with a baby is a balancing act: you want to have a well-stocked bag of tricks, but also don’t want to be overloaded. Checking luggage: Before Vera, I never checked bags, even for a long trip, but now waiting at the luggage carousel is an inevitability. You don’t want to juggle a baby and a suitcase going through security or boarding a plane, so stick to a diaper bag and/or purse/smaller bag for the flight. If you have stuff you really can’t live without for a day (in case of lost luggage) AND there are two adults traveling, one person might take a carry-on suitcase, but it’s easier without, and near-impossible for one parent alone. DIAPERS: Pack a few extra than you’d need on an average day; I usually figure on one per hour of travel for day flights, plus a few for the first night we arrive, with a minimum of ten. 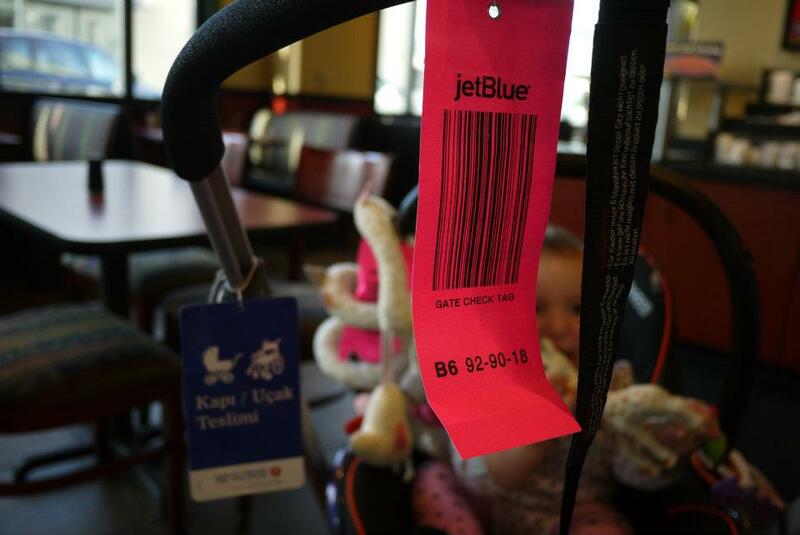 Divide them between your carry-on diaper bag/purse and stash a few extra in your stroller if you can gate-check. FOOD: Unless your baby is eating solids exclusively, it’s easier and less messy if you stick to breastfeeding or bottles during transit, but I now pack some baby food for layovers or arrival. Most airlines don’t offer baby food anymore (though Turkish Airlines nearly always offers me a jar or two) and I’ve yet to see any sold in an airport, so take one or two sealed jars in case security questions it (technically, they don’t have to be sealed, but I’ve heard stories about having issues with the TSA and baby food). If you pump, you can probably leave it in your checked luggage as pumping on a plane is a laughable idea, and if anything, you’ll be nursing more than usual on the flight. CLOTHING: No matter the time of flight or season, I always dress the baby in breathable (cotton) footie pajamas for the plane, and carry one or two spares. It’s one piece, it keeps her warm but not overheated, and helps her get in the “mood” for sleeping. If you can’t wear pajamas in the daytime when you’re a baby, when can you?! In winter, I take off her coat at the airport and stash it in the stroller storage bag, otherwise it just becomes another thing to carry. For myself, toting a baby makes you warm, so dress lightly with easy access for nursing, in something that doesn’t show stains easily. I always carry a pashmina-like scarf that’s actually a thin Turkish towel and serves as a blanket, play mat, nursing cover, and burp cloth. TOYS: While you may be tempted to pack an arsenal of diversions, babies don’t need much to stay entertained, and the more you bring on the plane, the more things you could leave behind. For babies younger than six months, small toys that can attach to a wrist, bag, or outfit are perfect for traveling. Take handheld or pocket-sized toys for older babies that don’t make annoying sounds. Don’t be afraid to get creative and use non-toys to entertain baby; since posting this article, I’ve added drinking straws and wallets to the list of diversions (dumping out the contents of my purse is also highly amusing to her, but not on a plane). Peekaboo is the easiest, cheapest, and most universal of games, and has even acted as an ice-breaker with other passengers on flights. Strollers: Though we’d never go even to the corner store without our Boba wrap, we always travel with a stroller as well. Even if you’re visiting a destination like Venice, where a stroller is more of a liability than a help, you’ll probably take it on the trip. A stroller will not only help you schlep the baby around, but it can be a lounging seat, a high chair, or even a bed in your hotel room, and provides extra storage space at the airport. In the first year, using a car seat as part of a travel system or with adapters (we used the car seat instead of the Bugaboo seat/bassinet for most of our trips up to eight months or so) is invaluable, and we are already bemoaning the fact that (almost) no toddler car seats can be used with a stroller (the Orbit is the only toddler car seat/stroller I’ve found, but it’s a big investment and not lightweigh). As to whether you check the stroller with you luggage or take it up to the plane to gate-check, there are advantages and disadvantages to both. If you are able to gate-check at the plane, use the stroller storage to carry anything you won’t need for the flight but might need immediately on arrival, such as extra supplies, winter gear, or even duty free purchases (be sure to pack anything breakable/meltable well or carry on). Unfortunately, some airlines are now requiring anything bigger than a folding umbrella stroller to be checked with luggage, and if you have international connections, the stroller may be checked all the way through to your final destination, even if you’ve gate-checked at origin. Check your airline’s policies before you go and at the airport, and plan accordingly. Take advantage of help: I generally consider London Heathrow Airport to be an unmitigated disaster, but on a recent trip, I discovered they have family-only security lanes. These are brilliant because they tend to be shorter than the general lines, staffed with helpful security agents who know the right rules, and you can take extra time getting through if you need it. If you’re traveling alone or with a lot of luggage, skycaps are worth a few bucks. You should be able to fold up the stroller to go through security and when boarding without assistance especially in the US (I’ve gotten help at most European airports when I’ve flown alone, and sometimes from other passengers), which can be tricky with a baby, so a carrier/sling comes in handy to give you both hands free. Budapest is the only airport I’ve been to yet which doesn’t require you to put a stroller through the metal detector, instead they scan it separately, which made my solo trip much easier. Lufthansa even has a family guide service at German airports (for a fee) that could be a benefit to novice baby travelers. While it seems to be all the rage right now to discontinue early boarding for families, take advantage if it’s offered so you can settle into your seat before the plane is full. Now that you’ve chosen a flight, packed your bags, and boarded the plane, what’s next? Find out next week when we post more tips for flying with a baby. *Okay, so every baby is different and I can’t guarantee that flying with a baby can be fun or easy, but the nightmare of spending hours trapped with a screaming, smelly infant on a flying hunk of tin isn’t an inevitability. With the right attitude and planning, you can survive it, and maybe even make all those nasty online commenters eat their words. Some of this has been adapted from articles on planning travel and flying with a baby on Gadling. Great advice! Couldn’t agree more on the need for a stroller. With it’s many uses, it’s invaluable for travel. I found travelling with a baby infinitely easier than with a toddler. The stage that we are at now (approaching two) seems to be the absolute worst time to travel. I long for the days of a baby that napped frequently and was happy with any food so long as it was mush.